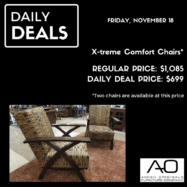 Daily Deal for Friday, November 18! Day 5! We have two more daily deals; today, come take a look at these x-treme comfort chairs! There are two chairs available at this price.